Aldershot, Farnham & District completed a hat-trick of women’s titles, also added the men’s event and took all of the fastest lap medals on offer at the South of England Men’s 12 and Women’s 6-Stage Road Relay Championships on Sunday, writes Martin Duff. 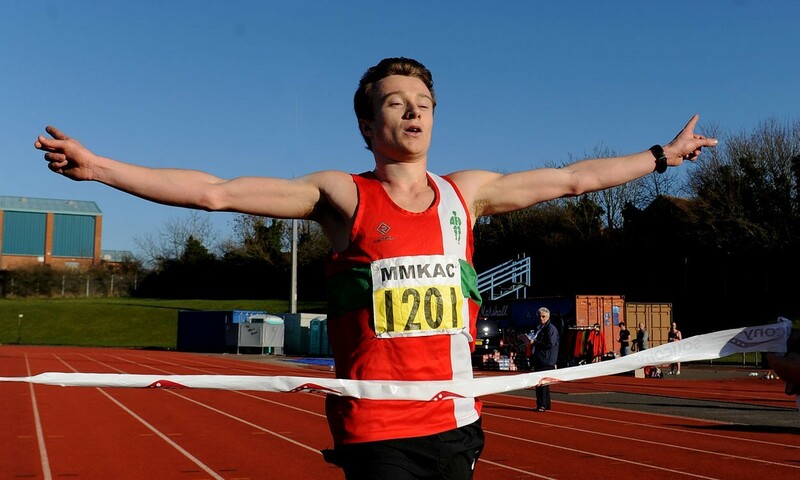 Kent AC had been expected to win the men’s event for the first time but were denied as Chris Thompson, in a build up for a London Marathon debut, decimated the leading times over the 7664m long leg at Milton Keynes with 22:35. Jonny Hay, pictured, nipped in with the quickest short lap time to anchor home Aldershot with the quickest 5013m short stage time of 14:41 as AFD won by well over three minutes. They were four minutes quicker than Newham’s winning 2012 time on the same course. Over the same lap, Steph Twell and Emelia Gorecka were the quickest women with 16:20 and 16:22 respectively, as their six-strong squad dominated, over second placed Belgrave and the rest, by more than eight minutes. They were a minute quicker than in their 2012 win. Although Laura Jane Day had given Notts AC an eight seconds advantage at the conclusion of the first leg, it was Birchfield Harriers who were to prove the dominant force in the Midland Women’s 6-Stage Road Relay Championships at a sunlit Sutton Park, writes Tom McCook. After Stacey Johnson took the lead on the second leg, Clare Grice and Sian Khan extended the Stagbearer’s lead to 73 seconds by Stage 4. Irish international Dr. Sara Tracey clocked 14:33 on the penultimate leg, which was to prove to be the fastest overall time by the slender margin of just one second from Catherine Blew who enjoyed a winning debut in a black vest. Birchfield Harriers stopped the clock in a time of 1:32:21 to eventually win by virtually two and a half minutes from Bristol and West AC who in turn were a couple of minutes clear of third placed Notts AC. After Rugby and Northampton AC and Coventry Godiva had set the early pace in the Men’s 12-Stage Relay, Jonny Thewlis, the Midland Cross Country champion, hit the front on the fifth stage to give Notts AC a lead which they were never to surrender. Notts AC crossed the finishing line in 3:31:42 to regain a title which they last held in 2008 by a margin of 79 seconds from Tipton Harriers with Bristol and West AC in the bronze medal position. Notts AC’s Sam Mitchell earned the accolade for the fastest long (5.08 miles) leg with a 24:50 performance by a dozen seconds from his team mate Thewlis. Coventry Godiva Harriers Chris Bannon’s time of 13:03 was the quickest short (2.69 miles) leg by nine seconds from Bristol and West AC’s Daniel Studley. » See next week’s AW, out March 20, for in-depth reports, pictures and results from all three area road relay events. A report from the Northern Road Relays can be found here.